Why the Collegiate Survey Project? 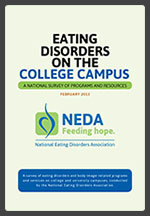 The study was launched in response to the volume of requests NEDA receives for information about eating disorder-related services on campuses, as the rate of eating disorders among college students surveyed from one college increased from 7.9% to 25% for males and 23.4% to 32.6% for females over a 13 year period (White, 2011). The increased pressure and stress of school and leaving home may lead to mental health problems among college students and a greater need for campus services. This is also a period of development in which disordered eating is likely to arise, resurface or worsen for many young men and women. Full-blown eating disorders typically begin between 18 and 21 years of age (Hudson, 2007). Although some students will experiment with dieting and escape unscathed, 35 percent of “normal” dieters progress to pathological dieting. Of those, 20-25 percent progress to partial or full-syndrome eating disorders (Shisslak & Crago, 1995). Given that eating disorders are the mental illness with the highest mortality rate (Arcelus, 2011), early detection, intervention and treatment is extremely important and gives an individual the best chance of recovery. Help-seeking decreases significantly when people are not aware of the options available to them (Ben-Porath, 2002; Friedman, 2009; Nolen-Hoeksema, 2006; Gould, 2007). In the study, respondents (campus service provider representatives) at 165 participating colleges and universities provided information on eating disorder-related programs and services, including: campus screening and awareness events; educational programs and workshops; counseling services; academic classes or programs; residence life and peer advisor programs; athlete services; and informational resources, such as articles, websites and pamphlets. The study was approved by Pace University’s Institutional Review Board. The Collegiate Survey Project finds that greater funding and resources are needed on college campuses to educate, screen and treat students struggling with eating disorders. According to the survey, access to education, screenings, and mental health resources are critical for early detection and prevention efforts, as well as encouraging affected individuals to seek proper treatment. Overall, 73 percent of the colleges surveyed offer NEDAwareness Week activities and 94.1 percent of all respondents stated it is somewhat (36.1 percent) or very/extremely (58 percent) important. Athletes were identified as a particularly underserved population on campus. While 100 percent of the respondents that offer education and screenings for athletes stated it is very/extremely important, only 2.5 percent of schools surveyed offer year-round prevention and education for athletes and only 22 percent offer screenings and referrals. Results indicate that additional funding and resources are necessary in order to meet the needs of students nationwide. This project was made possible thanks to the help of the following people, who dedicated so much time, expertise and talent. Download the matrix as a PDF.